None of these locations are good transfer points for a future Sepulveda Pass transit line, which is high on everyone’s wish list. 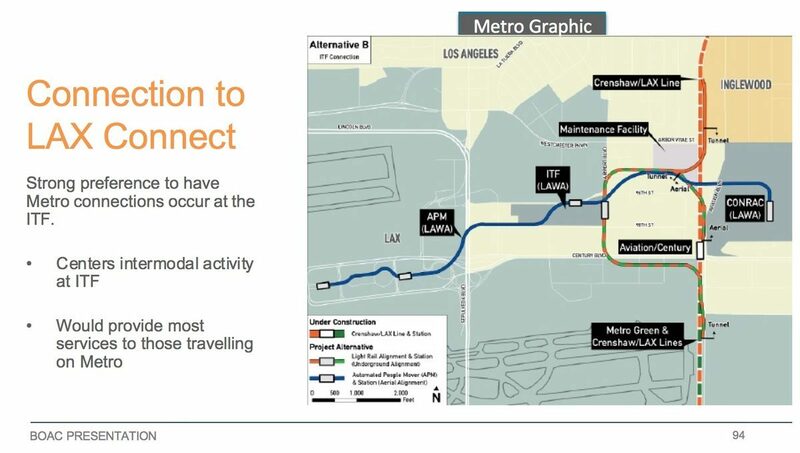 And earlier in the presentation, on slide 40, LAWA says that the only alignment that would connect to the Crenshaw Line station at Aviation/Century (the 98th St alignment) has been discarded. 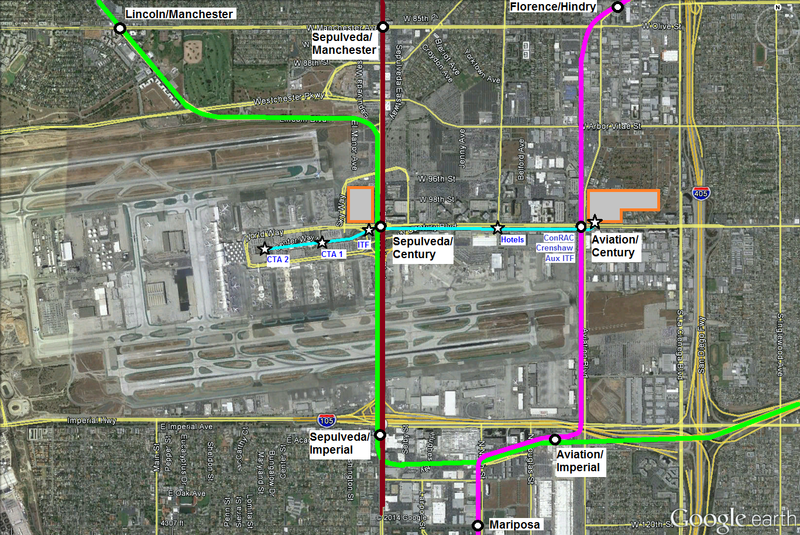 LAWA’s preferred APM option would cross the Crenshaw Line near Aviation and 96th. From a stop spacing perspective, it would be undesirable to construct another station on the Crenshaw Line about 0.3 miles from Aviation/Century. A stop at this location might also prove to be costly, as it is presumably very close to the interlockings that will connect the Crenshaw Line mainline tracks to the maintenance facility and yard that will be built at the southwest corner of the rail corridor and Arbor Vitae. That would still be better than LAWA’s preferred Metro connection at an ITF located at Airport and 98th. This option is very poor from a rail planning perspective. It sends through-riding passengers almost a mile out of their way and requires four small radius 90˚ turns in the space of about 1.2 miles, ensuring low operating speeds. It unhelpfully dead-ends the Green Line in a place with little demand other than the airport itself. It’s unclear what the service patterns would be, and if the Crenshaw Line is to split between the two routes, it would result in long headways at both the LAX station and Aviation/Century. It would require extensive modifications to Crenshaw Line infrastructure that’s currently under construction. And the price tag for this option would be high. An airport, an ITF, and a consolidated rent-a-car (ConRAC) facility. And Metro out there. . . somewhere. In all the options presented by LAWA, the locations of the ITF and the ConRAC are fixed. However, these are just buildings and parking garages, and as far as engineering goes, it’s easier to move them to the transportation lines than to move the transportation lines to them. Options with different locations for the ITF and ConRAC ought to be on the table. So here are a few options that might warrant more investigation. 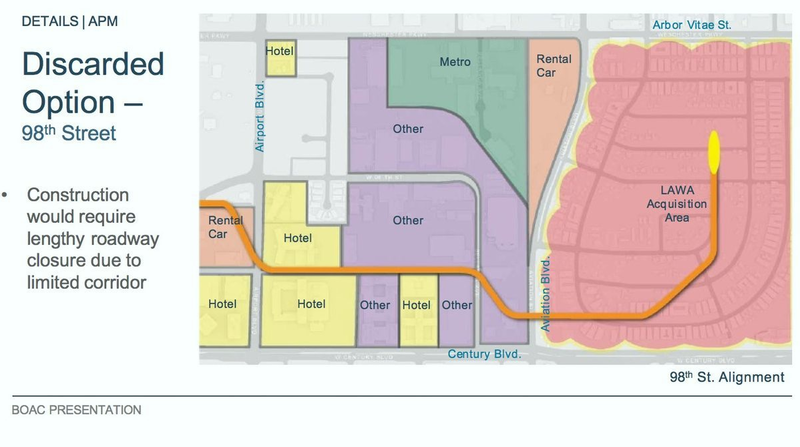 This option would put the ITF and the ConRAC at Manchester Square, the eerie almost-empty half-mile square bounded by La Cienega, Aviation, Century, and Arbor Vitae, which LAWA has been slowly acquiring over the years. 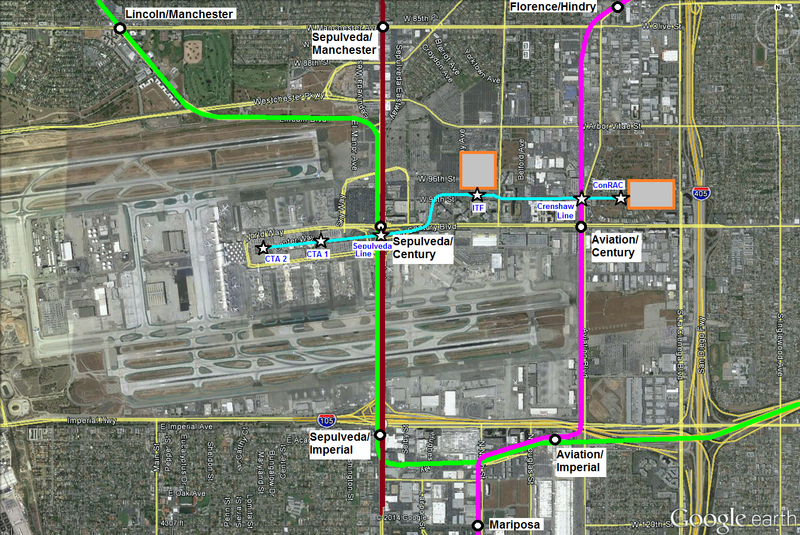 The APM would run along the south side of Century, with stops at Sepulveda/Century (Sepulveda Pass Line), Airport/Century (hotels), Aviation/Century (Crenshaw Line), and ITF/ConRAC. 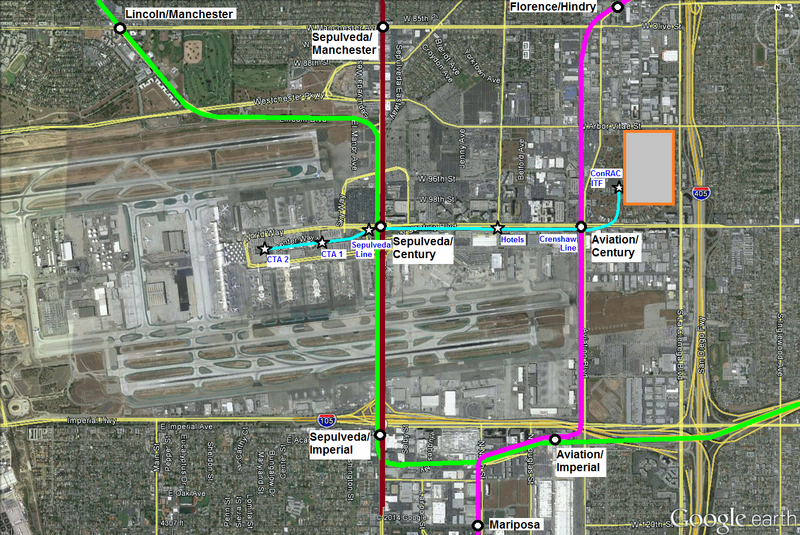 Note: if you’re wondering why I’m showing the Crenshaw Line, Green Line, and future Sepulveda Transit Line this way, see the intro post on Sepulveda/LAX Transit and Upzone El Segundo. This is more or less similar to the old LAX master plan circa 2007, which invited lawsuits from many adjacent communities. That plan was canned by Antonio Villaraigosa, who said he just wanted to move on, when he became mayor. That history means this option has baggage, but it shouldn’t eliminate it as a candidate. Good routes are still good routes, and lawsuits can be defeated (see Expo Line through Cheviot Hills and Purple Line through Beverly Hills). As I understand it, much of the unpopularity of the old plan stemmed from reconstruction of the runways that would have moved runways closer to Westchester and El Segundo. That reconstruction was purported to be necessary to add center taxiways between the two runways in each airfield. To be honest, I don’t know runways and air operations at all, so I can’t comment on that. However, I don’t think there’s any reason that the APM, ITF, and ConRAC can’t be separated out as their own project. If this is the best option for ground side access, it should move forward independent of more contentious proposals. Puts Metro rail connections between ITF and Central Terminal Area (CTA), requiring Metro riders to drag their luggage onto the APM and check in at the terminal. This option more or less follows LAWA’s discarded 98th St alignment, adding a stop at Sepulveda/Century to connect with a future Sepulveda Pass transit line. The ITF and ConRAC would be located where LAWA proposes to locate them. Proximity of the ConRAC to the 405. Acceptable alignment for the APM. Puts Sepulveda Pass transit line between ITF and CTA, requiring riders to drag their luggage onto the APM and check in at the terminal. Puts Crenshaw Line east of the ITF, which makes it of little use to riders on that line as well, because they will still have to take luggage from the train to the APM. Poor access to the ITF from the 105 and the 405 results in challenging traffic engineering. Complicated construction (per LAWA) on 98th St, but probably still easier than building a new Crenshaw Line station. This is my favorite option. The ITF would be split into two facilities, each offering full services. One branch would be located on the parking lot on the NW corner of Sepulveda and Century. The other would be located at Manchester Square, as close as possible to the NE corner of Aviation and Century. The facility at Aviation and Century would be configured to set back most of the garage from Century, allowing for more active uses (hotels, offices, etc) on the street. Direct ramps to and from the 405 and the 105 east would be provided to keep traffic off of neighborhood streets. 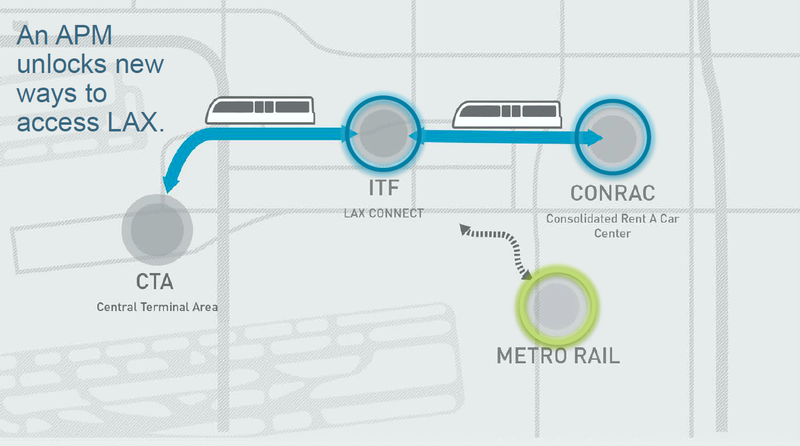 Allows direct access from both the Sepulveda Pass transit line and the Crenshaw Line to an ITF facility. Passengers would exit the train, check in and drop their bags, and then board the APM. No one would have to lug their bags onto the APM. Allows private transportation services to use either of two ITF locations, whichever best suits their service arrangements. This is the best option for both LAX-bound and through-riding passengers on Metro rail. The former get straight, quality routes, and the latter get a transfer that doesn’t require hauling bags all over creation. Precludes any possible development of “Terminal 0” at the parking lot on the NW corner of Sepulveda and Century. If we really want to roll out the red carpet for LAX passengers, LAWA should partner with the airlines, rental car agencies, private transportation operators, and hotels to direct baggage to the right destination for arriving passengers too. So when you check in to fly to LAX, you could have your bags sent to the ITF at the Crenshaw Line, or to the hotel, or to the ITF at the Sepulveda Pass Line, or the ConRAC, etc. This is just the sort of logistics problem that computers are supposed to make solving a snap, right? The environmental document plans for Crenshaw Line showed an auxiliary track in the middle of the station platform. I’m not sure if that’s still part of the plan, but if so, that track could be removed to create more space for vertical circulation to the APM and ITF/ConRAC. In any case, some modifications to this station will likely be necessary. This entry was posted in Uncategorized and tagged Crenshaw Line, El Segundo, Green Line, ITF, LAX, Sepulveda, Sepulveda Pass on May 13, 2014 by letsgola. That past option is pretty much perfect! Though I would personally prefer a higher stop density on the APM for more direct access to the terminals and hotels. Not so much because I care about convenience, but more because the convenience would allow the airport to more completely eliminate local shuttles from the traffic loop. The stop spacing could be changed, e.g. three stops in the Central Terminal Area (1/7/8, 2/5/6, 3/4/Bradley) and more on Century. You could also extend the APM east a little more to catch more hotels if you wanted. Stop spacing should definitely be up for discussion, after getting the basic route & connections to Metro right. Beautifully put, it is this logic as to why I’m against this forced ITF/LAX Connect instead of moving ‘LAX Connect’ to Century/Aviation where LAWA has a lot of owned land and right of way. In addition, the fact that the APM through the Central Terminal is not in a loop is just plain nutty LAX has a lot of interconnected flights between terminals so improvements to those connections are critical. I suppose at this point, the plan is still undetermined, so all those options are on the table. If some sort of restrictions or charge on entering the Central Terminal Area is needed to reduce the ridiculous congestion there, so be it. Ideally, the vertical circulation between elements like the ITF and rail would be designed to minimize inconvenience. For example, for the ITF at Aviation/Century, the APM will presumably be above the Crenshaw Line, so it make sense for the ITF check-in to be at the same level. Come in on Crenshaw, go up one level to check-in and bag drop, walk over to the APM. 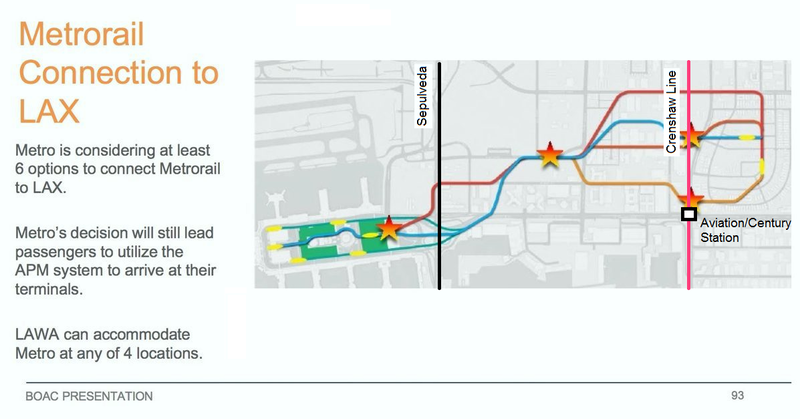 It seems as if the ITF idea is trying to have one people mover for both landside and airside connections. It’s strange. Atlanta has its landside MARTA connection, a landside people mover to the rental car facilities, and its airside people mover. Zurich has an airside people mover. I think what LAWA is trying to do is have two separate ways to get to the terminal – you either get to the ITF, check in your luggage, and then go to your terminal, or go directly to your terminal. It’s feasible, I guess, but it just seems duplicative. Could they not have one Terminal 0 place for switching from landside to airside and then use moving walkways or an airside people mover to get to the other terminals? As Joseph E notes, the cynical take is that they don’t really want to do anything transit-related. I don’t think that’s the case; they may be stuck trying to avoid ideas that have been contentious in the past, and some politicians have come out in favor of LAWA’s “LAX Connect” option despite its obviously poor route for through traffic on the Crenshaw Line. As a little bit more history, I think the original off-site terminal concept included security as well, so the people mover would have been only airside. I think security people did not like the idea of consolidating all passengers into one check point, plus if you put the ITF at LAWA’s location, that would mean the APM couldn’t serve and landside destinations it would pass. Maybe I’m misunderstanding the concepts, but it was never clear to me how all that would work with maintaining parking in the CTA. They shouldn’t even need the existing terminals for security – just do it all at one location, and then funnel people to airside concourses. The problem is the strange way the US does international-to-domestic transfers. In advanced developed democracies, your baggage is checked through to your final destination. In the World’s Freest Country ™ and its we-swear-we’re-not-Americans northern neighbor, you need to pick up your baggage, go through customs where nobody will so much as glance at it, recheck your baggage, and go through security again. This in particular means that you can’t really have a single terminal located far from where the international arrivals area is, unless you do fancy things like an internal security line just for international-to-domestic transfers. Atlanta’s hack is to have two security areas, the main one connected to MARTA and a separate one for the international terminal; that might be the least bad option. At least, the Bush administration taught people not to try international-to-international transfers in the US (unlike in adv. dev. democracies, where you do not need to go through immigration if you’re just connecting). I think that was part of the original proposal, but security people were strongly opposed. (I’m not defending our insane transportation security policies, but I think that’s how LAWA ended up where they are with security in current plans). Alon, many commenters on Curbed think that LAWA doesn’t want any connection with transit, instead they are still focused on maximizing parking revenue, with rental cars as a distant second priority. By this theory, they have picked terrible alternatives for the People Mover so they can kill it and stick with the current system. But perhaps they are merely incompetent. I think a lot of the problem with the frequent stops is that the downtown portion of the Blue Line (the original Max route) was designed for short on-and-offs. Parking downtown is rare so shoppers were abandoning downtown, and when money moves out, crime and degradation move in. It was probably a move to get people back into shopping downtown (until a couple years ago, it was free to ride Max downtown), and it worked. I personally think half those stops should be removed, which would still service downtown quite effectively. There are also stops that typically have no or few boarding/deboarding passengers, such as 7th Avenue (4 blocks from the Lloyd stop and 3 from the Convention Center) or 1st and Oak downtown. The only feature of either seems to be a few government buildings that have no ridership. I think Tri-Met is just too scared of criticism, to remove these useless stops. That many of the lines appear to go nowhere is well-founded, although there’s a bit more to that too. In many cases the lines follow major streets that have traffic issues, and the Max lines provide park ‘n’ rides. You’re assuming ridership is primarily people without vehicles. Portland has sprawl yet urban traffic slowdown, so there’s no way to run lines to dense housing areas (other than downtown) because we don’t HAVE dense housing areas. Tri-Met’s solution to provide congestion relief is to encourage people to still use their vehicle to get to the park ‘n’ ride, then avoid congestion by taking Max. And the complaint that the lines make hard turns on occasion is also true, and also irritating. In addition to being slow, there is the metal-on-metal high-pitched screech even though the train is doing 5mph. But I suspect this is because Portlanders tend to freak out when anyone wants to tear down a building, so again I think a lot of this is Tri-Met trying to circumnavigate Complaint Potential. Portland is full of protesters and politically active people and once you’ve raised people’s ire, you’re likely to lose. So yeah Tri-Met is wussy but knowing the local climate helps make it make sense. Also, the system was built for very moderate weather… more moderate than what we actually have. On hot days and cold days, they have to slow the trains way down. I have not heard an explanation of why it’s necessary on cold days, but they say when it’s over 90 degrees the rails can twist and roll. (The system of switches also has issues, particularly in hot or cold weather.) We had 26 days over 90 in 2015, which means that 1 in 14 days the Max has another reason it can’t move people quickly. To get from my place to airport via driving takes 34 minutes; via Max it takes 86, nearly 3x as long, and that’s in ideal weather with everything running on schedule. I’m not sure where they bought rail that twists and rolls; they must have been aware that trains span this nation without issues in hot climes, that must’ve been some hot bargain on crappy rail!